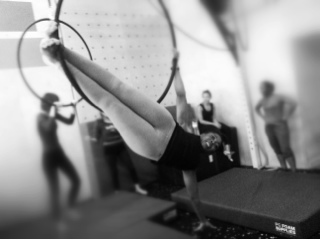 After trying out Aerial Hoop at Flying Fantastic in November (I shared that story with you in All the hoopla about Aerial Hoop) I decided I would give it another go. 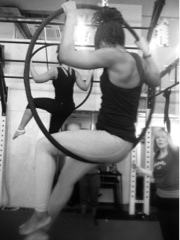 I was hoping that I had built up some more upper body strength, core strength and flexibility after my Intermediate 1 pole course and generally just trying to! 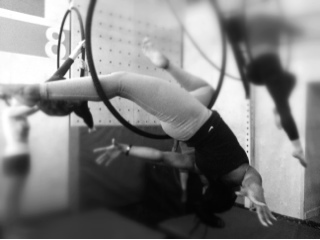 As I’ve told you all about Aerial Hoop before I won’t bore you with the details, but I thought I’d share with you some pictures of what I got up to! Thanks to Lex (author of Hidden Nasties), who came along with me and took these snaps! Man (Elle) on the moon! Unnamed. Can’t remember the name. Next time, I need to work on getting my leg straighter. This moved called for a little more flexibility than I currently have. Unnamed. Loved doing this move. If there is one thing I can do it’s arch my back! Thank you lordosis! Same pose as above, another angle! Mermaid. Final pose I tried for the evening. 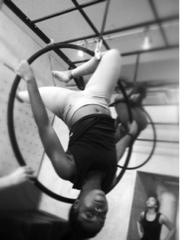 I was too scared to point my toes as I was only holding on with one had and the pressure of my feet pushing against the hoop! eeek! 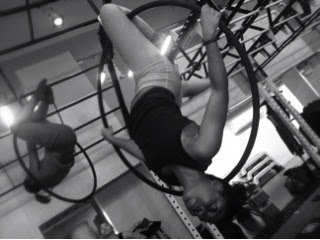 Wow Elle, looks like those pole classes have paid off with upper body omnipotence! 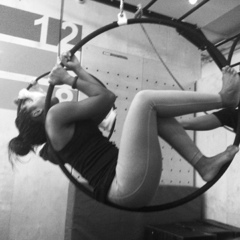 Your showing great strength in the hoop, inconceivably holding on with one toe during the Mermaid looked especially exacting, yet you manage to make it look sufferable. I believe it quite possible that I would fall on my head if I tried such aerial feats, congrats on making it appear easy. I find its easier to try new things if someone else has shown it to be so accessible. BTW, does spots of bruising appear anywhere that the pressure from the hoop becomes too great?